The woman is married, has two children, and is living with her husband. The fellow approached her with proposals, which she resented as a gross insult. He then threatened her life and that of her husband, and did fire two shots into the house in which they lived. Thereupon he was arrested, taken before Judge Cradlebaugh, and after the facts were elicited, was required to give bonds for his appearance at Court in the sum of five hundred dollars, or remain in the custody of the Marshal. As the parties were leaving the Court room, the woman in company with her husband walked up behind the Mexican, when she drew a pistol from her pocket and shot him dead, the ball entering under his left shoulder and passing through the heart. The act was applauded by those present. The Mexican was a desperado, who had served a term in the California penitentiary. The newspaper article above is presented here exactly as it was published in the Sacramento Union back on June 8th, 1860. News coming over the Sierra Nevada mountains by word of mouth was not out of the ordinary back in those days. That was especially true by 1860 that was the year that Carson City became the capital of Nevada, and any news coming out of it's capital was of interest on the west side of the Sierra Mountains in California. 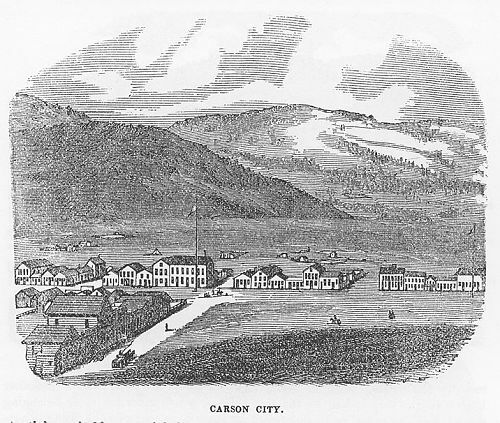 As a piece of trivia, Carson City was named for the famous mountain man Christopher "Kit" Carson. He was part of the first Americans who arrived with John C. Fremont and his exploration party into California in January of 1843. Carson was hired by Fremont for his expedition specifically because of Carson's knowledge of the region. As for the news story above, isn't it amazing how "the act was applauded by those present." I don't know if the Mexican desperado threatened her or not while walking out of the court, but all in all it really didn't mater. It appears that the brave woman involved was not going to take any chances. She was not going to wait for that desperado to harm her family while out on bail. Since those around her applauded, it tells me that she probably got off with killing him for reasons of self-defense. None of this surprises me really, back then folks simply did not wait for the law to handle their problems for them. People were a lot more self-sufficient, self-reliant, and knew real well that their security was in their own hands - and not that of the government. Whether it be the federal, state, county, or city governments, people back then knew that it was not the government's job to protect them from every harm. People knew without question that it was their responsibility to look after themselves. People back then did just that. The woman in 1860 who took it upon herself to shoot that Mexican desperado and not wait for the law to protect her family is a good example of that. Isn't it interesting that history is repeating itself since many Americans today are also realizing that they need to fend for themselves and not wait for the police to provide them security. While many of us never depended on the police for protection, more Americans today know way too well that by the time the police do arrive. Too many of us know the reality that by the time the police do show up, the perpetrators have come and gone, property has been broken or stolen, victims are injured or worse, and the police only take a report about what took place. As for those who get away with assault, battery, and worse? Since the vast majority of victims never see their assailants caught or prosecuted, the lack of consequence for the lawless is now making more and more Americans look after and provide security for themselves without any help from others. I see that as a good thing.